Imagine strolling down Chestnut Street between 3rd and 4th Streets in Downtown Columbus and you notice an old-timey pay phone behind a glass door. Curiously, you pick up the receiver and hear a muffled ring on the other side of the wall. A voice comes through your earpiece, inquiring about your name and member number. 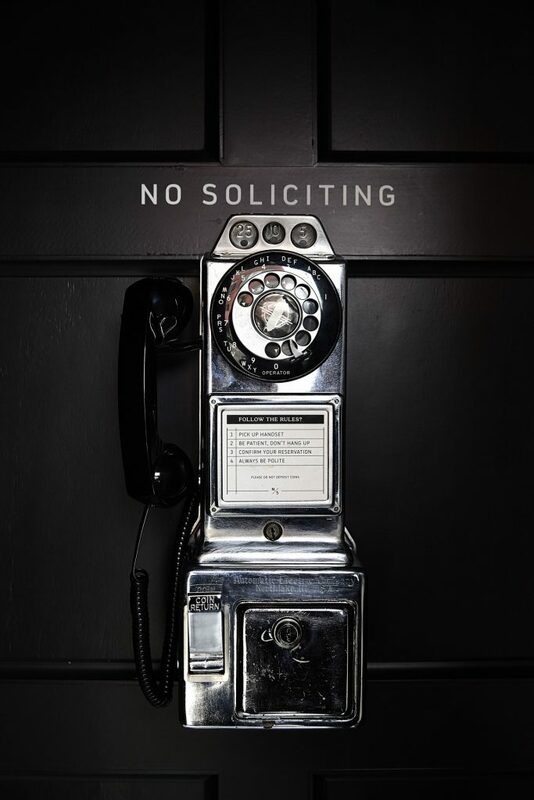 Then, one of two things will happen: either you’ll have no clue what the person is talking about, or, you’ll rattle off your personal code and be granted access to one of Columbus’ best-kept secrets: No Soliciting. If you aren’t among the roughly 320 individuals who possess one of those personal codes, it’s unlikely you’ve ever heard of this secret, members-only bar, let alone been inside. And this, dear readers, is precisely why the talented and trusted Brian Kaiser and I, armed with camera equipment, pen and paper, pretended to be No Soliciting members for an afternoon. From the small foyer with the old payphone where members check in, what appeared to be a black panel wall slowly swung open (imagine Addams Family-style, but cooler) and I stepped inside. Oaky and sweet smells greeted me upon entry. This was no mistake. 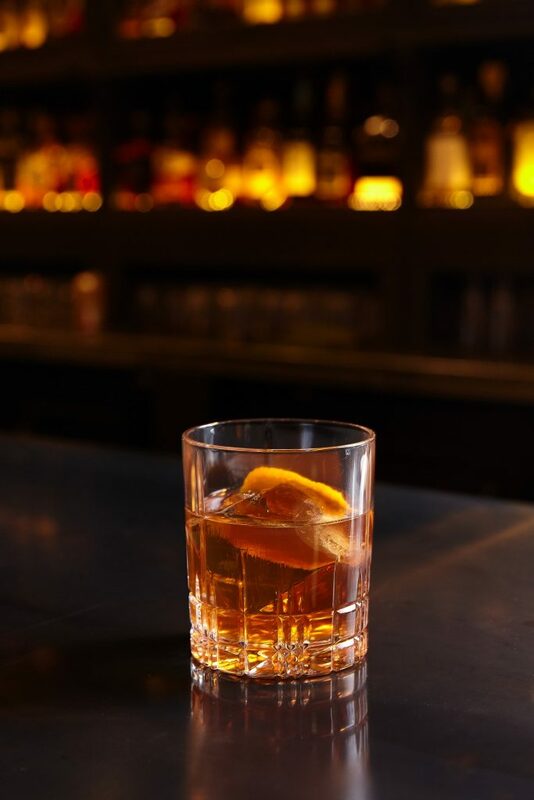 No Soliciting’s unofficial official drink is an old fashioned smoked with cedar and cinnamon. (As a person who can’t usually palate bourbon with ease, I put this handsome devil down effortlessly). Bartender Chris Yoha purposefully scorches a bowl of the wood chips and spices before the bar opens. Smart. The front bar area was sharp and sophisticated. 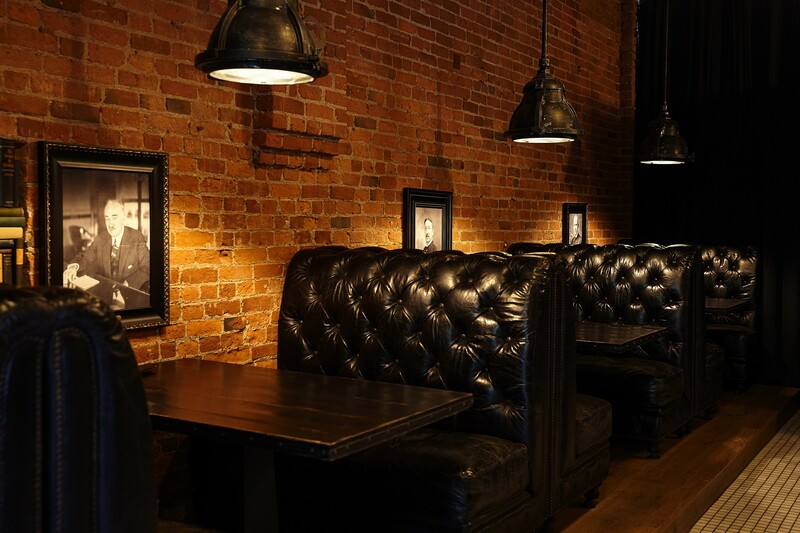 The leather booths adjacent to the bar were adorned with vintage headshots of America’s greatest entrepreneurial spirits—Walt Disney, King Camp Gillette, Alexander Graham Bell. I imagined all the important decisions No Soliciting members made in those booths, all while their heroes watched silently over them. You see, most of the club’s membership is comprised of business owners around the city. About a year and a half ago, before No Soliciting was No Soliciting, the space was simply part of Rise Brand offices. But, it wasn’t long before CEO Troy Allen was persuaded by local business owners and close friends to open the space to the public…curated public, that is. It began with 15 people close to Allen who are now known as the Founding Members. Wanting to create a space of like-minded individuals, Allen and his team began accepting applications with a vested interest in Columbus business owners. “It’s always nice to have that sounding board of other like-minded people when it comes to business owners to be able to talk to, share with, and understand perspective,” said Allen. Allen does not consider No Soliciting an eletists’ bar, but stands by the vetting process to protect the unique exclusivity it offers. The application contains all the normal fields—name, phone number, email—but further down, hopeful members are prompted to disclose more unique info, such as their expectations of being a member, what they would tell their 21-year-old selves, and who their reference(s) are. “The diversity that’s in here within the walls when we’re open is welcoming,” said Allen. Between members and their guests, Allen estimates the ratio to be a 50/50 split when No Soliciting is open. He guesses women make up a third of the membership, a number he’d like to see rise. “The ladies who are members are kickass members, frankly,” Allen said. 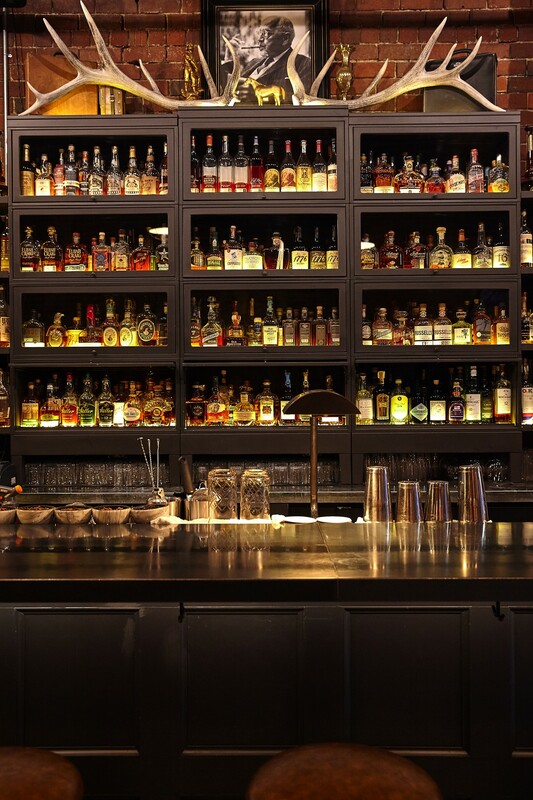 Once members make a selection from the upscale cocktail menu, choose from one of No Soliciting’s 300+ bourbons, or order up a customized adult beverage from the skilled bartenders (all member purchases expensed to their house account), they can venture further into the venue where a stately lounge awaits. Worn leather couches and armchairs are circled up and poised for conversation. Flags adorn the walls, concealing TV screens underneath. Animal hide rugs and foliage dangling from the skylight soften up what might be a masculine feel. The place has a tasteful sophistication that mentally and emotionally matured me at least a decade. I should’ve wiped the mud from my boots before, I scolded myself. Allen gleaned inspiration from his experience as a member of Soho House, a chain of private members’ clubs around the world. He respects what the other clubs around town are doing—country clubs, the Athletic Club, the Columbus Club—and extended admiration towards local cocktail bars, as well. But, what he saw lacking in Columbus was a more elevated experience that combined the two. Above all, Allen’s main m.o.—besides intimacy, exclusivity, and quality—is comfortability. He wants his members to feel a sense of belonging and connectedness, all while enjoying the luxuries No Soliciting can afford upon every visit: excellent cocktails, exceptional service, compatible community, controlled capacity. This is the culture Allen and Rise Brands hope to reciprocate in Dublin’s Bridge Park. 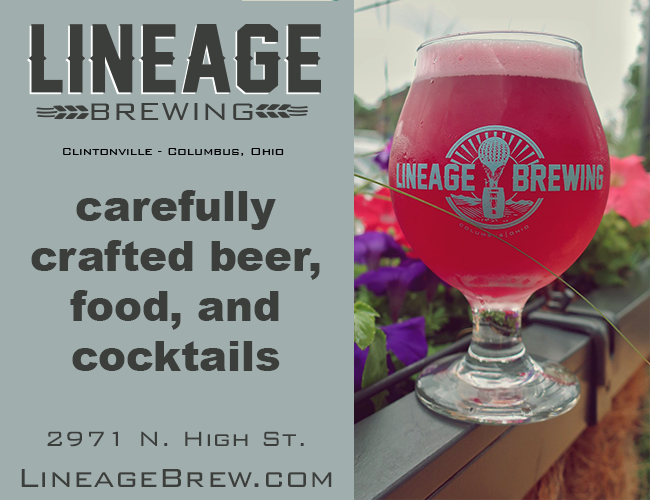 Not only will there be a second No Soliciting, but the flagship location will also be undergoing some major changes soon as the Rise Brand headquarters relocate to Long Street and are replaced by a full-service kitchen and event spaces for the members. “Rules are made for people who aren’t willing to make their own,” reads writing on one of the main walls in the lounge. And with No Soliciting’s speakeasy-style access, hushed and humble existence, yet powerful presence in a select part of the community, No Soliciting is certainly willing to write its own. No Soliciting memberships carry a $1,000 annual fee. While the club is currently not accepting new members, you can be added to the waitlist at nosolicitingbar.com.